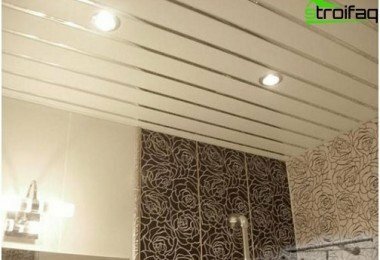 Installation plasterboard ceilings It allows to achieve a perfectly flat surfacewithout any special effort. 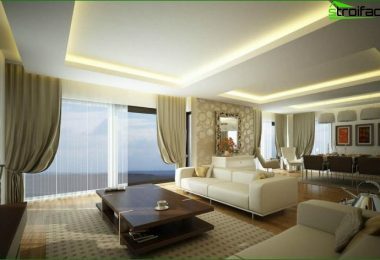 Designers are coming up with new designs of multi-level ceilings, which are embodied in the life of the master-Drywall. However, to achieve high-quality interior refinement without finishing impossible. 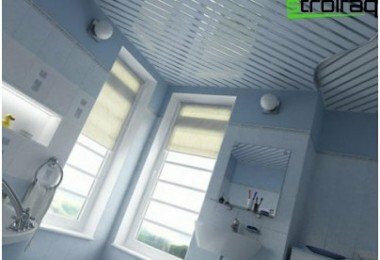 The beauty of the ceiling painting is dependent on compliance technology of its implementation. 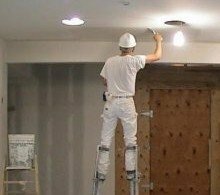 Therefore, before carrying out painting works with your own hands, you need to learn how to paint the drywall correctly, so as not to waste time and material resources. Caulking. Professionals are advised to use putties, which allow a perfectly flat surface after polishing. Acrylic primer capable of deep penetration. Water-based paint. It makes it easy to achieve a smooth and homogeneous staining. It does not smell. When you select should carefully read the instructions, which indicates the type of premises to be used. Kohler used if you wish to add a little color to the interior. Roller, planted on a long handle. By the choice of the roller should be approached very seriously, because of the qualities of this tool depends on the quality of the painting. Roller should be a new, better, if it is fur or velor. In no case do not choose a foam cushion, as when working with it produces a lot of bubbles on the surface to be coated. Plastic tray for paints, suitable for the width of the selected roll. This device makes it easy to wring out the excess paint. 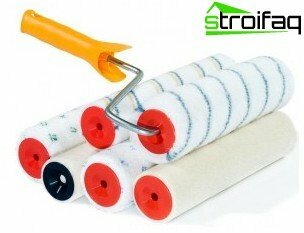 Brush, which will help to paint the ceiling surface in remote places, where the roller is inconvenient to use. Since the painting of the ceiling of plasterboard is associated with a spray, it is best to put on the clothes, which then can be thrown away without regret. Mandatory headgear designed to protect the hair from the water-based paint. 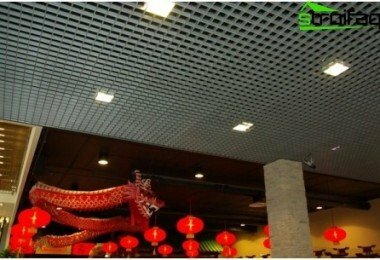 If you want to paint the ceiling laid down on the surface evenly, then do not be lazy to perform the whole complex of preparatory work in full. 1. Seal putty joints between gypsum boards, using a special reinforcing tape, called serpyanku. 2. Do not leave without attention the cap screws, which should not stick out above the surface of the sheet. This can easily be verified only after spending a metal spatula on the ceiling. If trowel "not stumble" it means all straight. Otherwise it is necessary to use a screwdriver to screw the screws. All places of fastening drywall to the profile frame also shpaklyuyut. 3. Then proceed to the sealing of the entire surface of the ceiling. Begin working with the angle, moving in the direction of the opposite wall, while trying to apply a thin layer of putty (2 mm) wide metal spatula. Give a day to dry the first layer. Then put a second coat of putty. 4. The well dried surface is sanded with fine emery trowel, which lead to the ceiling in a circular motion. 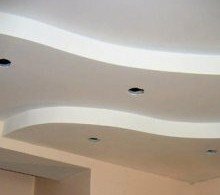 It is from this procedure depends on the smoothness of the surface of the ceiling. 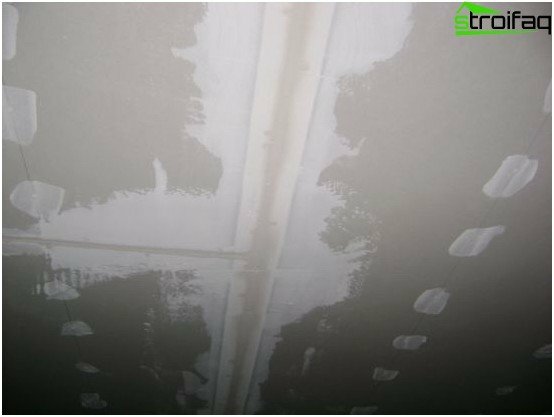 5. fine dust precipitated on the ceiling, clean cloth slightly moistened. The floor and the window is closed before starting the film. 6. The preparatory phase is completed priming, then painting the drywall is much faster and more economical. 1. Open container of latex paint and mix the contents with the help of a special nozzle placed over the drill. If the manufacturer in the instructions allows to add a little water, then we can do it. Although professionals are advised not to use the water. 2. On the perimeter of the room in places of contiguity ceiling to the walls paint over with a brush, and the movement must be jerky. This will avoid the appearance of bands, which will be visible after drying the ceiling. Carefully paint over angles. 3. Further, the course is a roller, which is dipped into the paint and rolled on ribbed surface of the bath. This allows you to evenly distribute the paint and remove excess with a roller. The first coat of paint is applied parallel to the window. 4. After the first coat has dried proceed to the second application, and the roller guide from the window to the door. Such cross-layer arrangement allows for a smooth uniform coating. After such a lesson should no longer remainissues. So, it is time to start to take action. Procuring all materials and tools wear work clothes and forth. 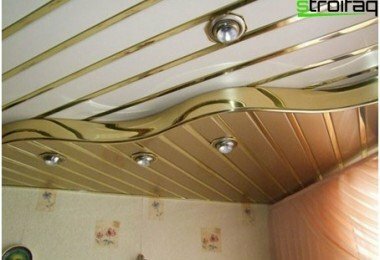 Ideal painted ceiling will decorate the home in which the repair can be done by hand.